ORLANDO - Nerlens Noel dominated everything except the backboard. But that was just a footnote in a long-awaited debut that lived up to the hype. Other than getting a little fatigued, the 76ers rookie center showed no signs of missing all of last season while recovering from left-knee surgery. Noel had game highs of 19 points and four steals to go with three assists and a blocked shot in an 83-77 setback to the Magic on Saturday at the Orlando Pro Summer League. The 6-foot-11, 228-pounder was deadly from the foul line, making 7 of 7. He also scored on an array of dunks, floaters, and hook bank shots. His only downside was finishing with just two rebounds in 26 minutes, 17 seconds. 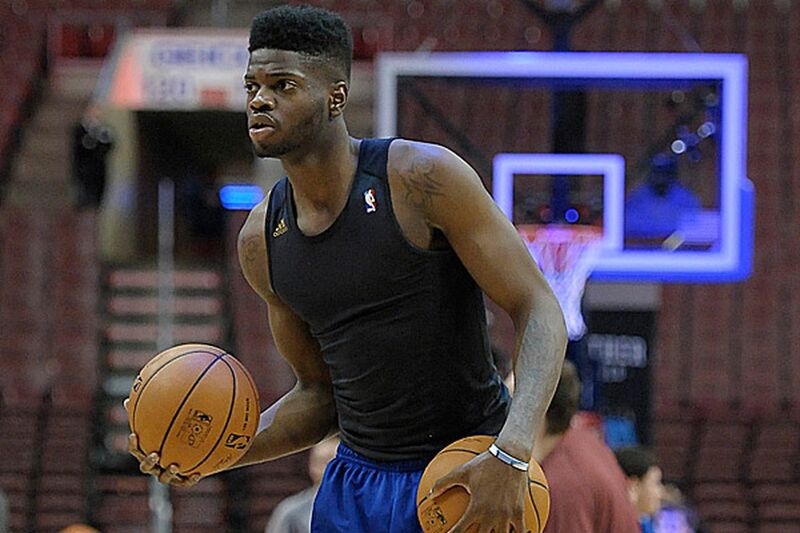 "Nerlens had a heck of a game today," said Sixers assistant Lloyd Pierce, who coaches the summer-league team. "Do we expect him to do it every single night? It's going to be tough. He hasn't played in a long time. "But we definitely want to build on what he was able to do today." His performance was one of the team's highlights. Pierre Jackson's injury was by far the negative. The initial diagnosis was that his right Achilles tendon is ruptured. If so, the reserve point guard could miss the entire season. Saturday marked the 20-year-old's first game in the 17 months since he tore the anterior cruciate ligament in his left knee during his lone season at Kentucky. Noel admitted to having jitters before the game. They subsided when he dunked shortly after he won the opening tipoff. "I thought it was well," he said of his performance. "I definitely need to continue working on my stamina and conditioning to sustain that for most of the game. So I can be more active on rebounds and continue to operate for my team." Foul shooting was arguably the most impressive part of Noel's performance. At Kentucky, he made just 52.9 percent of his free throws. But on Saturday he showed solid form while converting all seven attempts. Sixers general manager "Sam Hinkie [wanted me] to hit 60 percent on foul shots [this season]," Noel said. "But I told him I'd surpass that." Jackson suffered his injury while attempting to make a move for the ball in the backcourt. The 5-10, 185-pounder reached down to grab his Achilles once it happened. He then took a couple of steps before resting at midcourt. The Sixers will continue to evaluate him. "Thank you to everyone reaching out," Jackson tweeted. "It's highly appreciated . . . Pray for me." The rookie was having a solid performance before the injury, scoring seven points on 3-for-5 shooting. He also had a steal in 6 minutes, 55 seconds of action. The Sixers acquired him in a draft-night trade with the New Orleans Pelicans for second-round pick Russ Smith. Jackson was a prolific scorer in the NBA Development League last season, averaging 29.1 points. He was a two-time all-Big 12 selection at Baylor. "I'm feeling bad just for somebody to go through that," said Sixers point guard Casper Ware, who finished with 16 points, two assists, two steals, and six turnovers. "You are just right there at the peak to getting into the league, you know, about to play. I just feel bad for him." Former St. Joseph's forward Ronald Roberts had 12 points and nine rebounds for the Sixers.